Other modern additions include a 3-inch touchscreen display, a smaller joystick control instead of an array of directional buttons, a new 1:1 "Square Mode" functionality and some new Advanced Filters for users looking to get creative without needing to make edits on their computers or smartphones. The XF10 also includes built-in Wi-Fi and Bluetooth. There is also 4K video recording, although it comes with a maximum frame rate of just 15 frames per second. 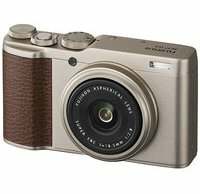 To learn about the other new features in the XF10 and find out if it's the right camera for you, head on over to our Fujifilm XF10 preview. Stay tuned to Imaging Resource for more information on the camera as we near its August release.